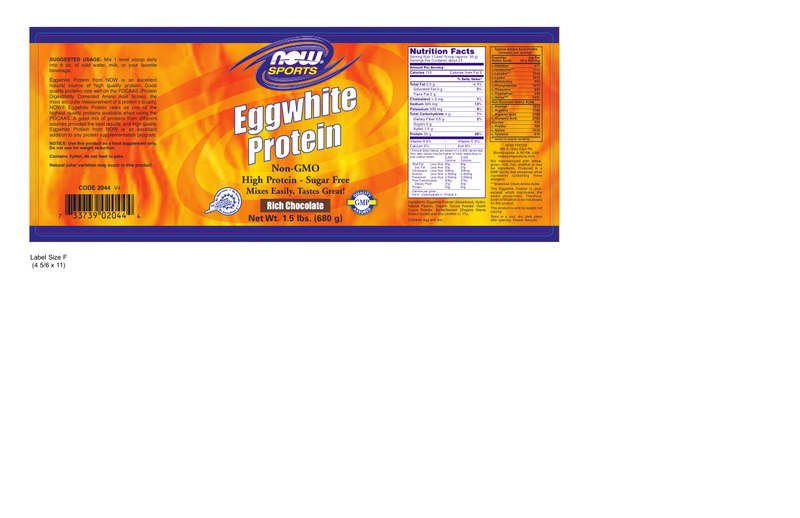 Eggwhite Protein from NOW is an excellent natural source of high quality protein. Good quality proteins rate well on the PDCAAS (Protein Digestibility Corrected Amino Acid Score), the most accurate measurement of a protein's quality. NOW® Eggwhite Protein rates as one of the highest quality proteins available when using the PDCAAS. A good mix of proteins from different sources provides the best results, and high quality Eggwhite Protein from NOW is an excellent addition to any protein supplementation program. Mix 1 level scoop daily into 8 oz. of cold water, milk, or your favorite beverage. Store in a cool, dry, dark place after opening. Contains no: Â sugar, salt, starch, yeast, wheat, gluten, corn, soy, milk, shellfish or preservatives. This Eggwhite Powder is pasteurized which inactivates the avidin glycoprotein.Â Biotin fortifcation is not necessary for this product. This product is sold by weight not volume. Store in a cool, dry place. Â Please Recycle. Xylitol is harmful to pets; seek veterinary care immediately if ingestion is suspected. Learn more about pet safety. Use this product as a food supplement only. Do not use for weight reduction.